here is my problem. I built my own tower. from the start the system was running into some issues and i could not get a hold of what it was. Basically, the when i am browsing the net, sometimes all tabs will crash. When i am gaming, it crashes and brings me back to desktop. sometimes it simply freezes. The most remarkable is that there is no pattern to the crashes, sometimes i can play for hours without a problem, sometimes it will crash after 2 minutes. i was told to try running a report using the integrated performance monitor and so i did. i managed to fix a few issues with the help of google etc, now the issue shifted to another one, and games and browser still crash in the same ways. Now the performance monitor suggests that i need to optimize my maximum buffers and buffer size. What is this? And how do i do this? is it a realistic problem to my issue? Maybe some of my hardware are not compatible? maybe i am missing something in my build? any suggestions will be deeply appreciated! The very first thing i did was check if all hardware was plugged well. Then i did a fresh re-installation of windows. finally i tried to switch PCI-e port in which my GPU is plugged, tried the same with the RAM. I am pretty sure now that all drivers are installed correctly, and that i have no viruses or anything of the sort. according to a CPU-Z report neither of my cores exceed 31degreesC during normal activity. 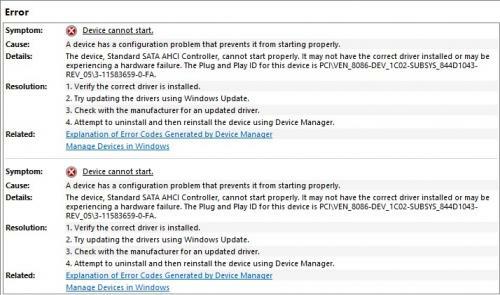 Basically it was saying : The device, Standard SATA AHCI Controller, cannot start properly. 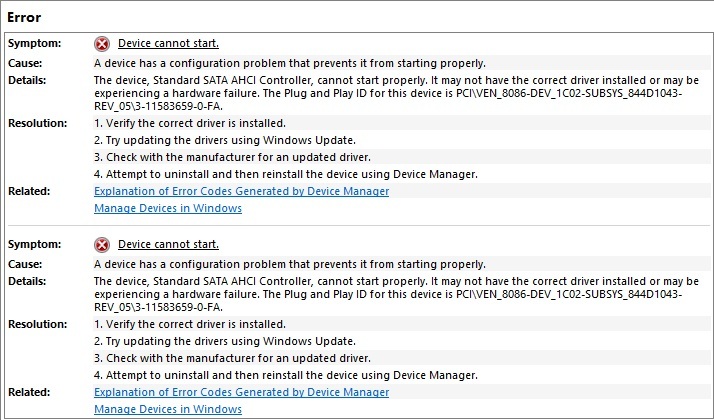 i managed to fix this error by downloading an appropriate driver from my motherboard's website. second thing was saying: "High average interrupts / processor. This machine has 8 processors and 5 network cards. Total Interrupts/sec on the machine is 54501. The average interrupts per processor per sec is 6813." Edited by MrFunky, 18 October 2017 - 04:08 PM.